Bacon is all the rage right now! OK, so maybe the bacon craze has been going on for a while, but seriously…bacon seems to be everywhere these days! Pinterest is buzzing with amazing looking bacon recipes, August 30 is officially International Bacon Day, and a group of food bloggers have coined August as Bacon Month. My city also held its 2nd annual bacon festival earlier this summer. Yep, that’s right, an entire food festival dedicated to yummy bacon creations. 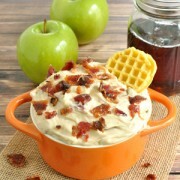 So I thought it was about time that I joined in bacon mania with this recipe for maple bacon dip. 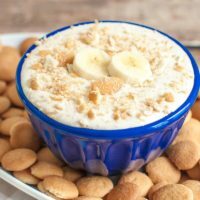 This would be an awesome breakfast or brunch dip for tailgates or other gatherings. 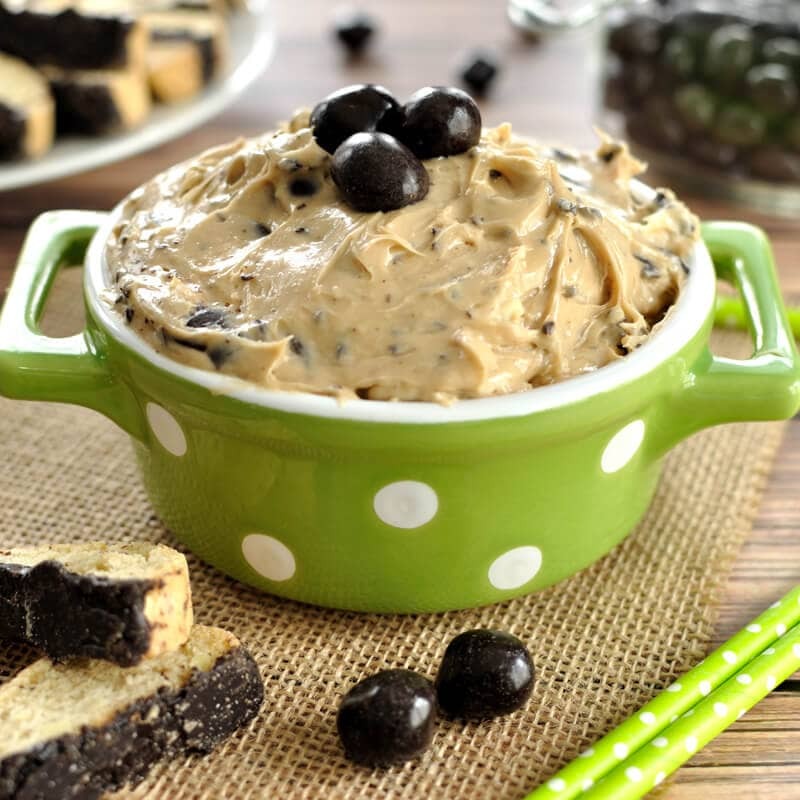 This is a sweet dip with a slightly buttery flavor and the salty taste of the bacon. 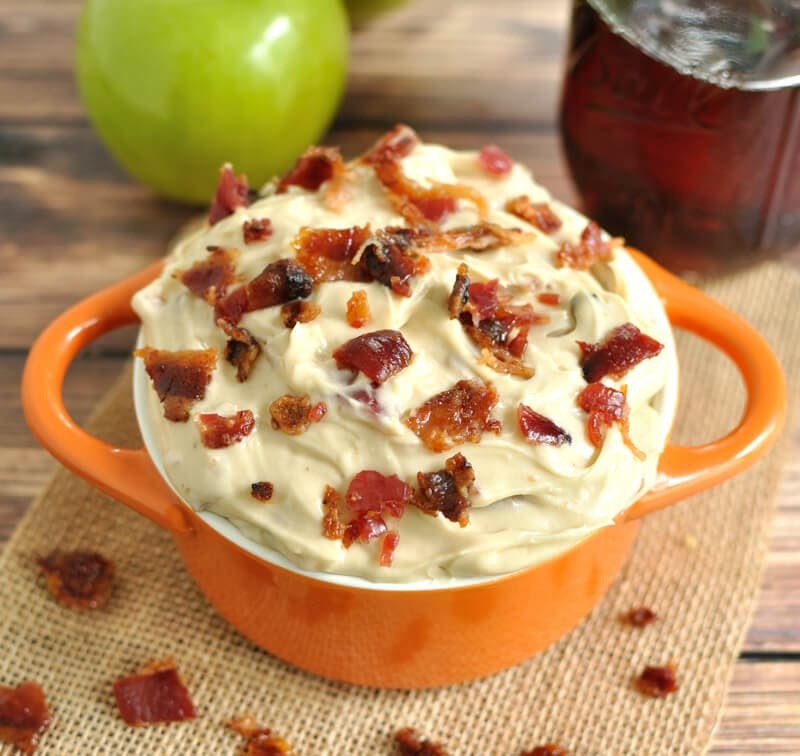 The maple bacon dip goes really well as a fruit dip with apple slices. Or dip in graham crackers or mini Eggo waffles. 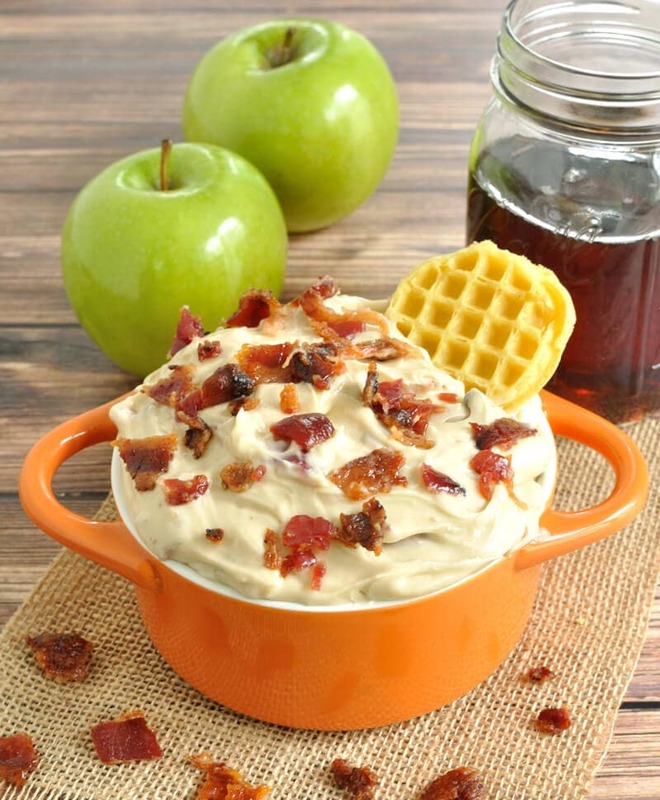 Served with the bite size waffles, it is like having an entire breakfast meal in one dip. How cool is that? 🙂 Lots of food companies seem to be coming out with “mini” versions of their products which make great dippers. This dip comes together very easily with just a few ingredients. The hardest part is making the candied bacon which isn’t really hard, but just takes some time to cook. I used this maple and brown sugar bacon recipe, but you could use a different candied bacon recipe if you have a favorite. Maple and bacon is probably my favorite bacon flavor combination. What is your favorite flavor or food to go with bacon? 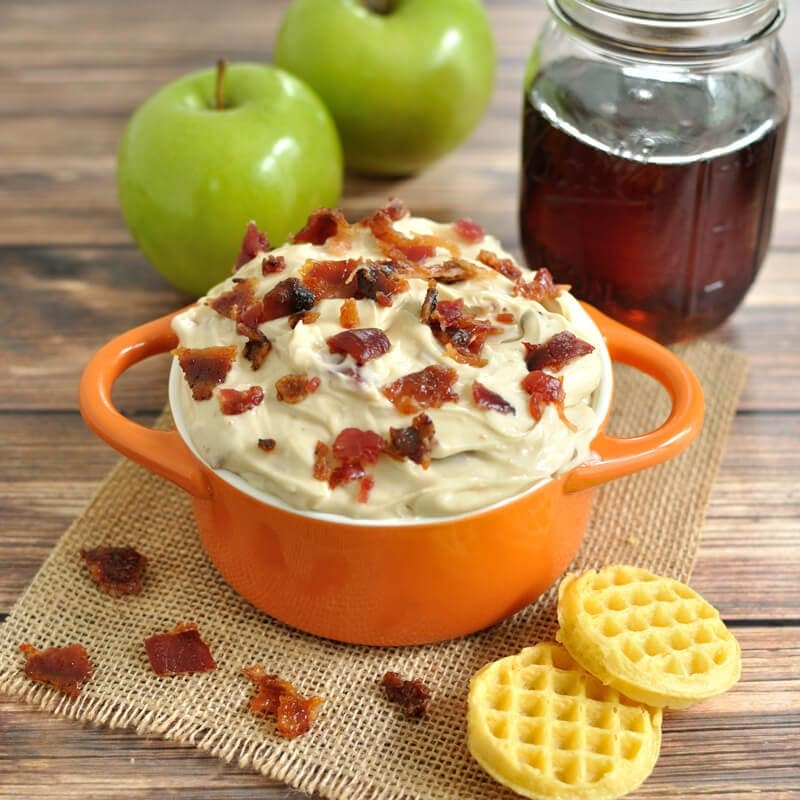 Easy dip recipe with real maple syrup and candied bacon. 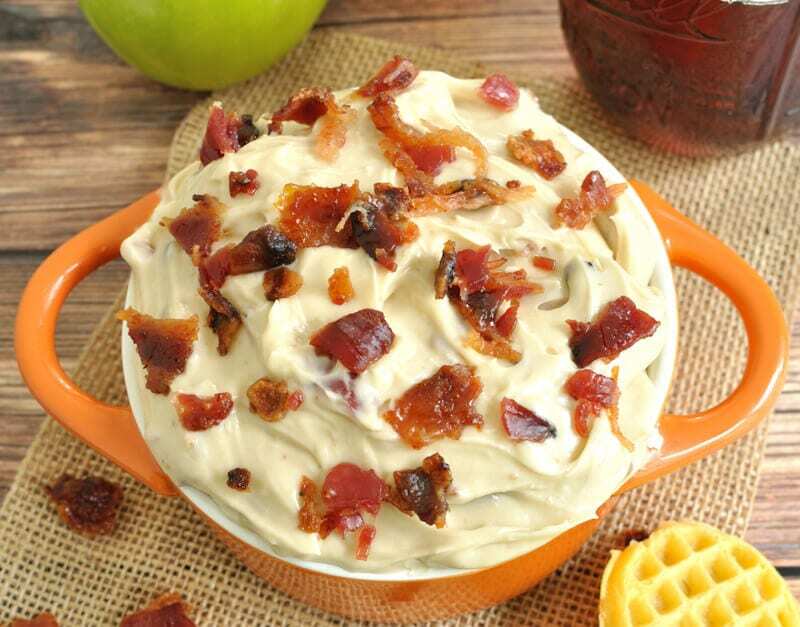 Maple Bacon Dip is a great breakfast or dessert dip for a brunch, party or shower. Cover the bottom of a baking sheet with foil and place a cookie cooling rack on top. (This allows the bacon grease to drain and not make a mess). Spray rack well with a non-stick spray and place bacon strips on rack. In a microwave safe container, heat the brown sugar and maple syrup. Brush warm mixture on top of the bacon strips. Bake for 35 minutes or until bacon is brown and a little crispy. Let cool. In a medium bowl, beat together the cream cheese and butter until mixture is smooth and creamy. Add in brown sugar and powdered sugar and mix until well combined. Stir in maple syrup until well mixed. Crumble 4 pieces of the candied bacon and fold into the dip. Crumble the last piece of bacon and sprinkle on top of the mixture. Serve immediately with apple slices, graham crackers, or mini Eggo waffles or chill until ready to eat. 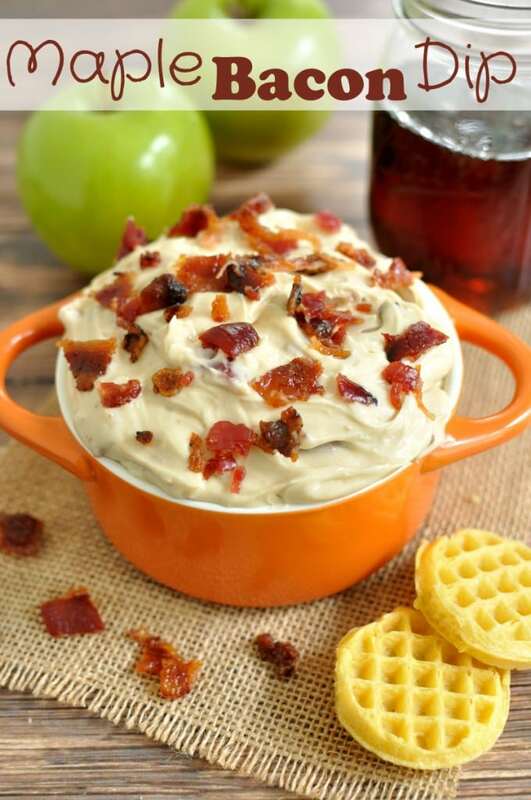 love maple and bacon together… i can imagine how good this dip would have tasted! This dip was a huge success with our office Dip it Day! I used apple chips for the dippers, but we also tried Club and Ritz crackers; both were tasty. That’s awesome! Thanks so much for the feedback and I’m so glad that everyone liked the dip. Great suggestions for dippers too! I’ve been waiting for an event to take this too. Just made it for tomorrow’s 49er game tailgate party. It tastes so yummy even at room temp. I can’t wait to try it tomorrow once it’s cold. Thanks Rebekah for the comment and really happy that it was tasty 🙂 I hope everyone liked it! What temperature is the oven at for baking the bacon? I’m wondering what it would taste like if the bacon were just plain, not candied. I haven’t tried it with regular bacon, but I imagine it would still be good, maybe just a bit more savory. What is the yield/about how many servings does this make? 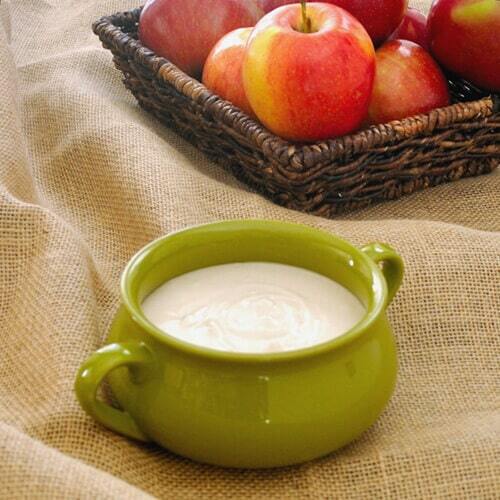 This makes just over 2 cups of dip. Does this taste like the one they serve at yard house with their sweet potatoes fries?? Please help trying to recreate! I’m sorry, I’ve never eaten at a yard house so I can’t say if it is similar or not.